A 497 km stretch of the Pan-American Highway E35 or "Troncal de la Sierra" (completely paved) joins Ecuador's two UNESCO World Cultural Heritage Sites of San Francisco de Quito (Quito) & Santa Ana de los Cuatro Ríos de Cuenca (Cuenca). People often ask the question whether they should fly from Quito to Cuenca or travel by bus, or car. The answer is primarily dependent on your available time. A return flight from Cuenca to Quito takes 45 minutes and if booked in advance costs U.S.$ 55.00. The drive is a magnificent scenic route through the agricultural plateaus of the Sierra mountains taking about 10 hours (non-stop driving and longer in the rainy season). Highly recommended if your schedule has sufficient time available to enjoy the significant points of interest along the way. We have both flown, and driven, on several occasions depending on both purpose, and our available time. 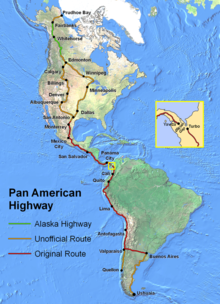 The Pan-American Highway is a complex network of roads forming the longest highway of 48,000 km in the world. It passes through many altitudes, diverse climates and ecological zones, from rugged, volcanic, snow capped, peaks to dense, lush green jungles to sun-drenched arid, sandy deserts and coastal plains. The Highway links 18 countries within the North & South American continents extending from Prudhoe Bay, Alaska to Ushuaia, Argentina except for a 100 km break due to impenetrable rainforest jungle and swampland called the Darién Gap. Home to Colombian guerrillas and exotic wildlife it is not possible to cross between South America and Central America by road. This portion of the journey must be bypassed by air or sea, with ferries available to ship vehicles from Panama to Colombia. This route from one tip of the Americas to the other was first proposed in 1889 as a railroad. However nothing became of the proposal. In 1923 the idea emerged again, this time as a highway. On July 29th 1937, Bolivia, Chile, Colombia, Costa Rica, El Salvador, Guatemala, Honduras, Mexico, Nicaragua, Panama, Peru, and the United States signed the Convention on the Pan-American Highway and agreed to begin construction. Canada, Brazil, Argentina, Venezuela, Ecuador, Suriname, & Guyana have unofficial connecting or alternate highway routes. We found it very interesting to learn that Canada has never been an official partner, nor have Canadian connecting highways ever being " official designated " as part of the Pan-American Highway. Controversy exists in the U.S. and elsewhere when there are multiple highway routes available. Leaving Quito traveling south to Cuenca this 497 km section of the Pan-American Highway is a modern divided 4 lane expressway. Some of it using the ancient Incan Empire Qhapaq Ñan trail connecting Quito in the north to Santiago, Chile. Two parallel chains of the Andes rise to their dramatic peaks on either side forming the " avenue of the volcanoes. " Cotopaxi, the highest active volcano ( 19,350 ft ) in the world can be seen on a clear day. A patchwork of lush green agricultural fields, dairy farms, cattle ranches, and sheep pastures, fill the plateau and valleys between the Andean ranges. 80 kms south the modern expressway ends and an older two lane highway with limited and poor signage continues. The highway now passes directly through the centre of towns and villages, where traffic, traffic control lights & round-abouts, speedbumps, pedestrians and animals slow your journey. Upon reaching Latacunga, if it is Thursday, make time to stop at the weekly Saquisili market. Hundreds of indigenous stalls fill the streets selling handicrafts, agricultural produce & livestock. A popular sidetrip to the west is the Latacunga Loop featuring Laguna Quilotoa, a beautiful turquoise crater lake. We have done this excursion previously through to Quevado. Winding through dusty, poor market towns in the windswept paramo of the high Andes. Over 100 km is rough, a mere single lane dirt track not for the faint of heart. The lonely, barren, steep crags, bleak remoteness, and bitter wind feels more like one has entered the Himalayas. It is best to explore this area by bus over several days. In an Andean valley a further 50 kms south is Ambato, lying on the banks of the Ambato River, and capital of the province of Tungurahua. The city has about 200,000 residents and is host to Ecuador's most important celebration the Festival of Fruits and Flowers. The restless earth has wreaked havoc and destroyed this city on several occasions, most recently in 1949. The city has little historic character. There is a lateral by-pass which avoids the large metropolis city centre. Not directly on the E35 but now only 40 km east of Ambato is Baños, our premier resort and the most popular tourist destination in Ecuador. A most beautiful natural setting at the foot of the Tungurahua volcano, home to hotsprings, thermal baths, over 60 waterfalls, and a gateway to the Amazon. If you are lucky, and it is clear, you can see the snow-capped volcanoes of Cotopaxi, Tungurahua, Carihuairazo, and Chimborazo. The rich volcanic soil continues to provide a patchwork of diverse agricultural farms which now include peach, apple, and plum orchards. Salasaca, an indigenous group work the land in this area. Anchoring the southern end of the Avenue of Volcanoes is the Chimborazo volcano. In the Chambo River Valley, Riobamba is the next major city a further 50 kms south. It is the capital of the Chimborazo Province in central Ecuador. Although approximately the same size as Ambato there is a by-pass to avoid the city centre although when missed with minimal signage it becomes a major challenge to navigate through. Leaving Riobamba the scenery changes significantly. The now narrow two lane highway leaves behind the agricultural valley plateau to traverse the rugged, craggy mountainsides of the Andes. Many switchbacks on a route climbing the cliffside, and descending the canyons. Uninhabited stretches between cities is much longer. Although much slower travel, an extremely scenic area. This remote area is home to the famous Nariz del Diablo ( Devil's Nose ) train route zig zagging descent from Alausí. One of the world's most impressive railway engineering feats. 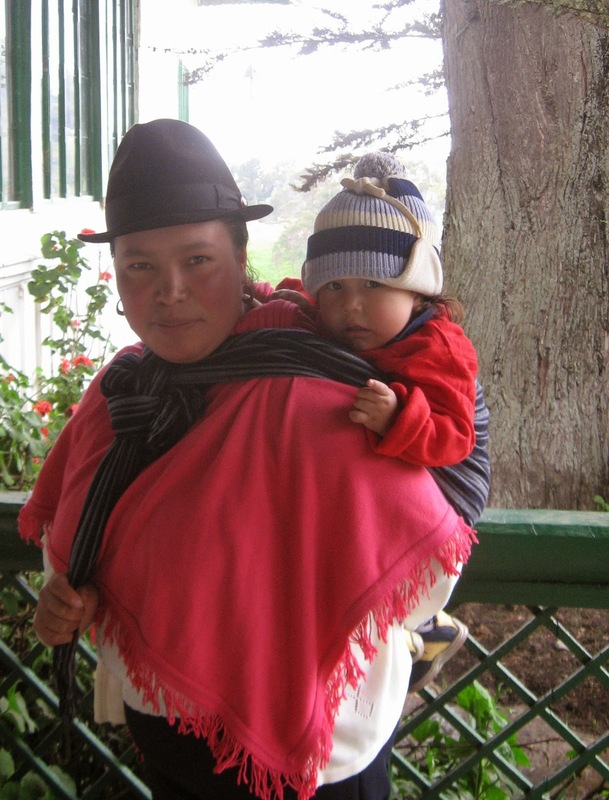 Alausí is a train town perched on the Andes steep plunge to the west. The statue of San Pedro overlooks the town. This rugged area of the Andes is also prone to landslides which can vary from rock & debris on the road to be dodged, slick wet mudslides to be traversed carefully, or patiently waiting until highway equipment clears an impassable blockage of the highway. El Tambo & Cañar are the next towns with a colorful market and the nearby ruins of Ingapirca- a highly recommended 10 km detour off the Pan-American highway. Cañar plantation is located 65 kilometers from Cuenca and provides entry to the famous ruins of Ingapirca. 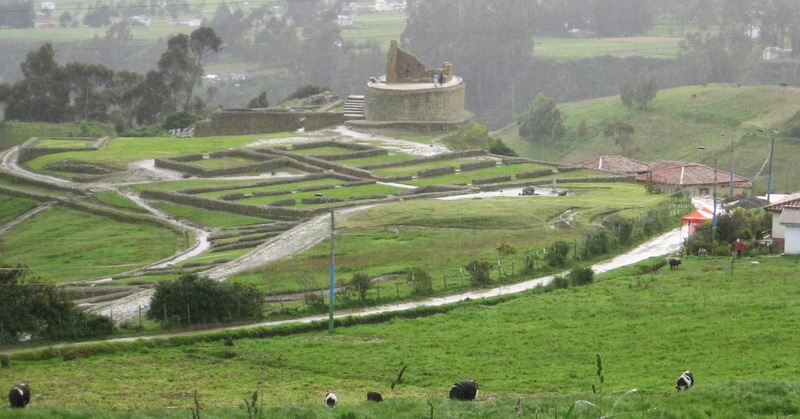 In the 15th century Huayna Capac ordered stores, bathrooms, a tambo for the Inca, and a temple dedicated to the sun be built, perched on a picturesque hillside. Azogues, the capital of Cañar Province, only 29 kilometers from Cuenca. In this city of colonial atmosphere the highlight is San Francisco's convent perched on the summit of a sacred mountain. Well lit in the evening it is a majestic sight. A modern divided 6 lane highway connects Azogues to Cuenca. However at this time, it is being repaired or upgraded and in the darkness of night it was like a maze to navigate lane closures, multiple detours, unpaved sections with oncoming headlights. Finally arriving in the colonial historic city of Santa Ana de los cuatro ríos de Cuenca. Cuenca in the southern Andes of Ecuador, is in a basin made by a confluence of four rivers and surrounded by mountains on all sides. It's European flair, along with boosting the finest colonial architecture, 54 cathedrals, and intellectual Universities. Cuenca prides itself in being the artesanal and cultural centre of South America. The variety of the landscapes on this road and the abundance of sights and activities during the trip is remarkable. It reflects unique natural beauty, and the contrasts of wealth and poverty. A most interesting, beautifully written post. It makes me want to do that drive again. Thanks for posting. Great, long overdue, description of the Pana. A couple of minor items. The devil´s nose starts in Alausí and descends in the direction of Guayaquil. The train between Riobamba and Alausí has relatively few curves. Excellent feedback, thanks so much and we have made the corrections to the article. Great blog post, enjoyed it! Thanks, glad you enjoyed !